Early map of western Long Island with property owners. Map of Long Island Based upon Recent U.S. Coast Surveys, Together with Local Maps on File. Supplemented by Careful Territorial Observations. [Brooklyn, Queens, Nassau County]. This is a western section of a four part 1896 map series by E. Belcher Hyde, detailing western Long Island from Brooklyn to Hempstead and Freeport and from Glencove south as far as Jones Inlet, including Brooklyn, Queens and Nassau County. The map is highly detailed and noted railways and stations, roads, bridges, rivers, inlets, bays, light houses, water works, houses, hotels, schools and a host of additional topotgraphical features. Towns noted include Sea Cliff, Glen Cove, Garden City, Hempstead, Rockville Center, Freeport, Far Rocakaway, Jamaica, Flushing, Newtown, Brooklyn, North Hempstead, Long Island City, Coney Island, Hempstead and others. Also notes Jmaica Bay, Rockaway Beach, Long Beach etc. Identifies several railway lines, including the Long Island Railroad and the New York Sea Beach Railroad. This map was created based on information from the United States Coast Survey and consequently is rich with soundings and maritime details. This includes flagged lifesaving stations all along the coast of the island. This map was engraved by Balliet and Volk and 'entered according to act of Congress in the year 1896 by Hyde and Company in the Office of the Librarian of Congress, at Washington. Published by Hyde and Company in 1896. Hyde and Company (fl. c. 1880 - 1920) (a.k.a. E. Belcher Hyde Map Company) was a Brooklyn, New York, publisher of maps and atlases. Hyde's work primarily focused on Long Island and the fire insurance industry, which required highly detailed maps of cities and towns in order to assess risk and liability. Many of Hyde's maps offered incredible detail at a large scale, including annotations on property owners, building materials, size, and function. 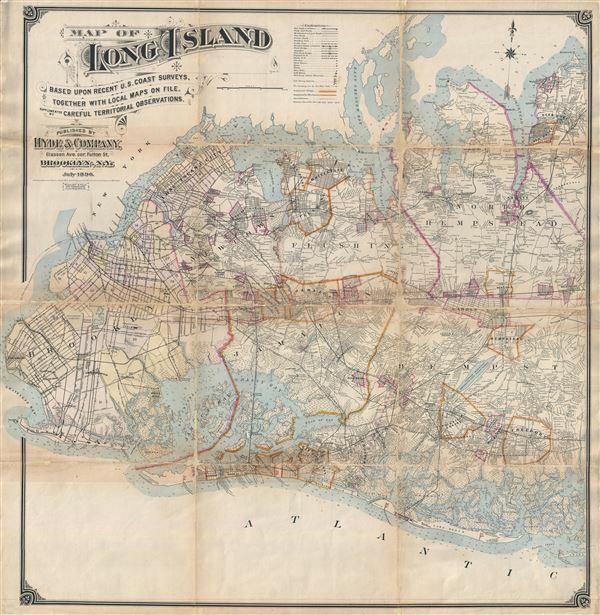 While Long Island was the focus of most of the firm's efforts, it also produced atlases of the greater New York City metropolitan area, including the Bronx, Queens, Manhattan, and Westchester. Good. Backed on archival linen. Some discoloration, splitting and loss along original fold lines - see image. Restored.